I worked out at 8:30 this morning, and what a beautiful morning it was! Begin by completing a power clean, ensuring that you stand to full extension. Once you do so, complete a front squat. Again, stand to full extension before completing push press (not push jerk). In other words, you may not complete a full squat clean and thruster instead of a power clean, front squat, and push press. Lower and rest the barbell on your back and complete a back squat. Push press (not push jerk) the bar from the back rack position, bring to shoulders, hips, and then floor to complete the rep. Choose a manageable weight (coaches will provide additional guidance) and focus on fast, explosive lifts. Keep the bar in control at all times. For an added challenge, complete burpees when not lifting. There, I said it. I completed 2 rounds @ 95#, 5 @ 105, 7 @ 115, and last round @ 125#. Coach Jeff watched last round, and he thought I wasn’t going to be able to successfully push press from behind the neck. He of little faith. Did I go up on my toes? Yup. I was up for the added challenge, so I completed burpees each round. I did, however, stop doing burpees 45 seconds after the minute for all but the last round. My goal was to complete a minimum of 100 reps, and I completed 112. ‘Twas exhausting. ‘Twas also very fun! I was the odd man out, so I completed solo. I substituted GHD sit-ups for V-ups and used a 60# KB and 30# slam ball. My goal was to complete all rounds of all reps unbroken, and I almost managed to do so. Dammit. Damned double unders. I completed 7 rounds of sit-ups, KB swings, and lunges, and 6 slam balls shy of 7 rounds of double unders, hollow rocks, and slam balls. I completed all but the very last round of double unders unbroken, missing the 21st rep. Dammit. Dammit, dammit, dammit. I demonstrated hollow rocks for both sessions, and Jennifer G. may have copped a feel. BIG crowd at Community Workout! 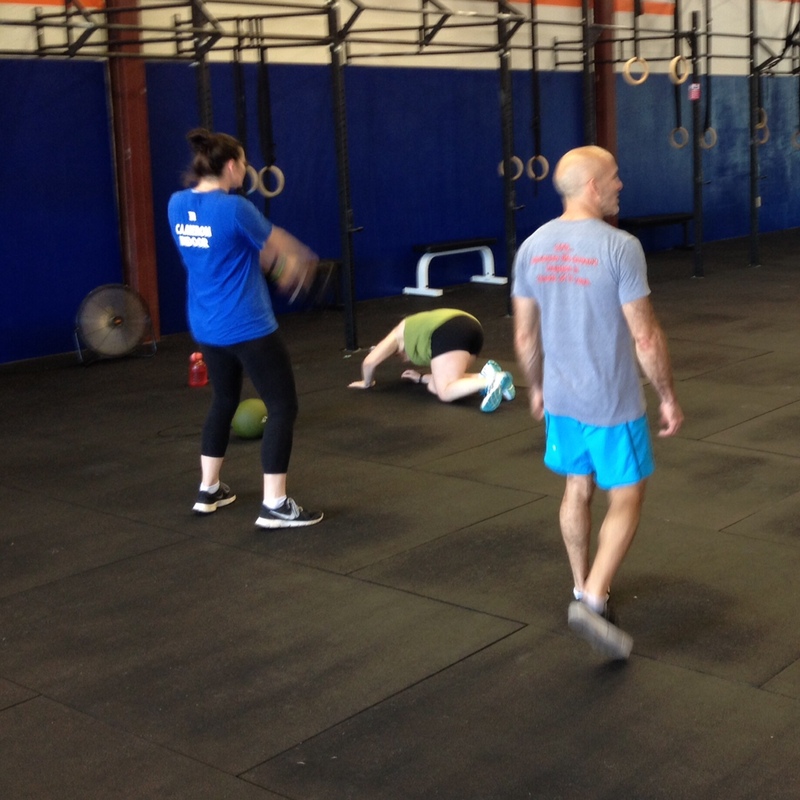 I always appreciate members who encourage friends and family members to try CrossFit. It’s not nearly as frightening as many folks this it is. I promise.